The new Black FX1000 is a first-focal-plane riflescope designed with the long-range competitor or plinker in mind. It’s shown mounted in Nikon’s excellent 20-m.o.a. cantilever mount. If you’re not up to speed on the Black line from Nikon, it’s the firm’s top-of-the-line tactical series. The new Black FX1000, a first-focal-plane scope, is available in 4-16x50mm and 6-24x50mm models—illuminated or non-illuminated and in m.o.a. or mil adjustments. 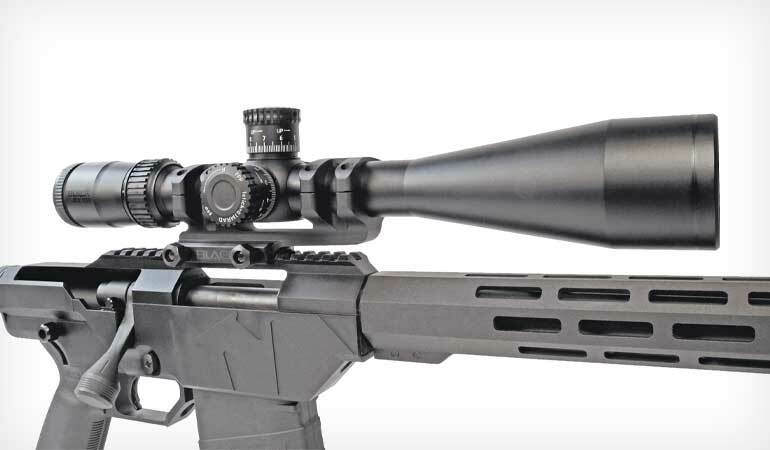 It’s designed to meet the needs of discriminating long-range shooters, whether the goal is to win a match or simply have fun ringing steel at 1,000 yards and farther. All the Black FX1000s have side-focus parallax adjustment and are built on 30mm main tubes. I tested the 6-24x50mm illuminated version with mil adjustments (or if you prefer, as Nikon does, MRAD). It’s matte-finished, measures 15.2 inches long and weighs a handy 24.5 ounces. While it doesn’t matter as much with a scope such as this, which will go on a Picatinny rail, mountable tube length is 6.5 inches. 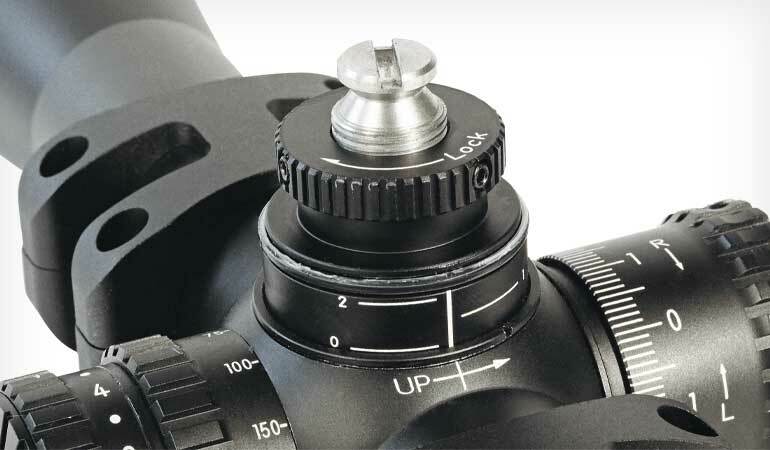 The scope was mounted in Nikon’s excellent Black cantilever scope mount, a light, sturdy unit machined from 6061-T6 aluminum and featuring a 20 m.o.a. cant. I put it on the Mossberg MVP Precision reviewed elsewhere in this issue to put it through its paces. Since I always used the scope in bright daylight, I didn’t mess with the illumination other than to simply work the adjustments. There are 10 illumination levels, with an Off position between each one. The illumination dial is positioned outside the parallax dial, but there were no issues with the parallax moving when adjusting the illumination. It was a little trickier going the other way, but only because the parallax dial is tightly fitted and required a bit of force and a good grip to move—sometimes causing me to turn the illumination on or off, at least when making parallax changes while maintaining a shooting position. The power ring moves with just the right amount of tension, although if you feel like you require more leverage from a shooting position so you can go faster, Nikon sells tis Switchview zoom-ring extension. Adjustments were spot-on, and the scope had no issues passing a box test. The clicks felt positive in both elevation and windage turrets, and the turrets are well-marked to enable even those of us cursed with bifocals to be able to see what we’re doing. To use the zero stop, remove the turret cap, loosen three screws on the zero-stop ring and turn it all the way down. Then reinstall the turret cap. Underneath, you’ll find the zero stop ring. It has matching T6 screws. Loosen these (again, not all the way because they can fall out) and then turn the ring clockwise until it stops rotating. The proper direction is clearly marked “Locked.” Then tighten those screws, replace the turret cap and, with the “0” mark properly aligned, tighten the turret cap screws. With the change from the original Black X1000, a second-focal-plane scope, to the new FX1000, Nikon also redesigned the etched mil reticle. It’s now numbered, with even numbers beginning at two mils and ending at eight mils on both axes. Odd-numbered mils are the same height as the numbered hashes, and halfway in between each full mil there’s a 0.1-mil gap, which provides a handy frame of reference. The gap between individual stadia lines is 0.3 mil, and the gap between the main portion of the reticle and the heavy outer portion is one mil. At first I thought the reticle would be a bit tough because the height difference between the intermediate stadia lines is only 0.1 mil, and I thought I’d get lost. But in practice it worked fine, and I was able to discern the line I needed to place on the target with ease. The model I tested carries a suggested retail price of $800, which I think is more than reasonable for a scope of this type. For that money you get a really capable scope with excellent glass, a great reticle and an overall sensible setup. And it comes with Nikon’s No Fault lifetime repair/replacment guarantee. As long as your scope hasn’t been stolen or you purposely do something to damage the scope, Nikon will take care of you.